Published Jun 26, 2017 By Julia 8 CommentsThis post may contain affiliate links. 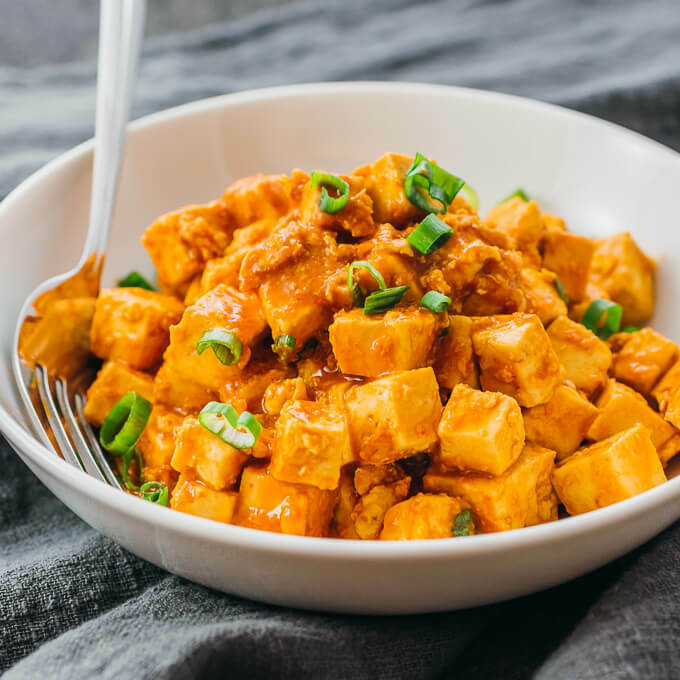 An easy way to cook tofu stir fry with a spicy Asian sauce. Vegetarian and low carb recipe. I first made this easy tofu stir fry a few years ago, and with just one dish I converted Mr. Savory Tooth from a self-avowed tofu skeptic to a fanatic convert. He now regularly requests this dish — and why not, as it’s healthy and a great vegetarian dinner option. It also has really delicious spicy sauce that I can’t get enough of. When I ask people why they don’t like tofu, it’s usually because they think the texture is weird and chewy or the flavor is bland. 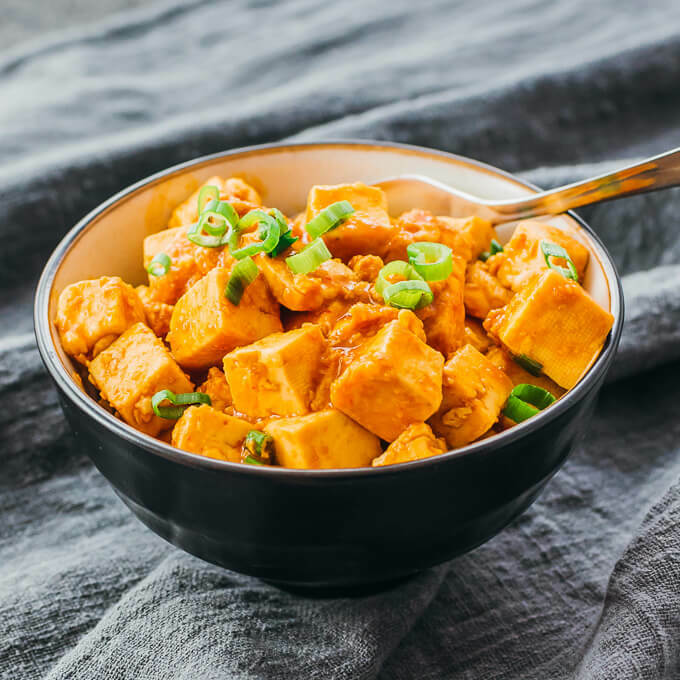 You won’t find either to be the case here; the tofu is soft and tender, and there’s plenty of flavor from the sauce and scallions. Tofu starts off as a blank slate so sauces are key. What kind of tofu should I buy? There are different kinds of tofu that you’ll find at the grocery store: extra firm, firm, medium, and soft. 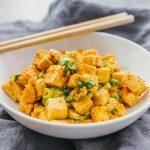 You should get extra firm tofu for stir fry recipes including this one — extra firm tofu holds up better and won’t fall apart as you stir it on a hot pan. I usually use the Nasoya brand of tofu, which I’ve found at a regional supermarket as well as Whole Foods. In a grocery store, tofu is usually found near the produce in the refrigerated section. The tofu will come in a big block, packaged in liquid. Before using, all you have to do is drain out the liquid and cut into small cubes. How do you cook a tofu stir fry? 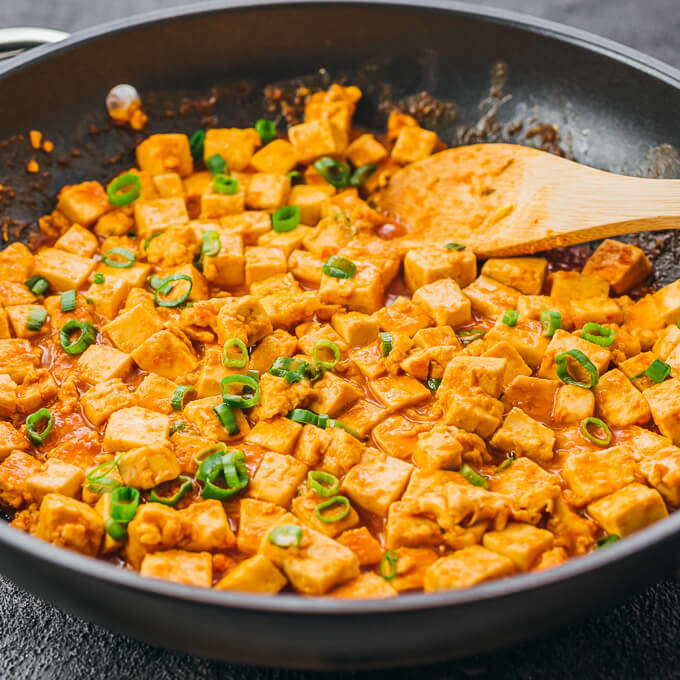 After the tofu has been drained and cut into small cubes, you should add them to a nonstick pan and place over medium heat. I let the tofu cook by itself on the pan for about 10 minutes, stirring occasionally, so that any remaining moisture can evaporate. Then I scramble in two eggs. Next, I stir together all of the sauce ingredients in a mixing bowl, including soy sauce, sriracha, rice vinegar, sesame oil, garlic powder, and a sweetener. I pour this sauce over the tofu and stir to coat the tofu with sauce and let it simmer a bit to soak up the sauce. For the sweetener, I use erythritol, which is a low carb sweetener with no impact on blood glucose or insulin. If you’re not following a low carb diet, you can use honey or brown sugar. Or you can use something else if you prefer. This recipe demonstrates a quick and easy way of cooking pan fried tofu. If you’re looking for a meatier tofu dinner recipe, you can check out my mapo tofu dish, which has tofu with ground pork and a chili-garlic-bean sauce. For creative (read: crazy) tofu ideas, check out this list of tofu recipes where you can make tofu skewers, tofu cheesecakes, tofu soups, tofu smoothies, and more. A simple and easy tofu stir fry recipe with a spicy Asian sauce. In a bowl, combine all of the sauce ingredients and stir until well-mixed. Set aside. Heat a large nonstick pan over medium heat. Add tofu cubes and cook until their released liquid has evaporated and they start to turn lightly yellow, about 10 minutes, stirring frequently. Crack eggs over the pan, immediately stirring it with the tofu to scramble. Stir until the eggs are cooked, about 1 minute. Stir the sauce and pour it over the pan. Mix everything together so the tofu is well coated in the sauce, simmering for a few minutes. Remove the pan from heat. Stir in the scallions and mayonnaise. Serve immediately. This recipe yields 10 g net carbs per serving. Nutrition info assumes that erythritol is used as the sweetener, which cannot be digested by the body. Really enjoyed this recipe. I will be making it spicier next time. Loved this recipe I found by accident!!! So flavorful and low carb!! Yummilicious!! OMG LOVE THIS!! It’s hard to find flavorful, filling recipes for “ketotarians” – I will definitely be making this again. I’m glad you enjoyed it! If you like Indian flavors, check out my roasted cauliflower curry. It’s a bit high on the carbs, but very good! This tofu is fantastic. Totally converted my non-tofu loving partner and toddler. And it’s so easy! Making it again tonight. This was very good, fast and easy to make. I used just ne tablespoon sriracha and forgot the mayonnaise but we liked it a lot. Will definitely make again.